(Hanoi, Vietnam) — I don’t even know how to begin to explain this place. Hanoi is large, but it’s impossible to tell that as the streets are so tiny and dense with life that it seems impossible that they could go on for miles. I almost think it’s funny now that I found Ho Chi Minh City intense. Hanoi absolutely trumps it on that level. Here, on one little street, there will be bicyclists and pedestrians and a few small, pushy cars, not to mention people driving the wrong way on their motorbikes as they carry everything from their three children to a stack of mirrors (I saw the first instance, and someone told me about the latter). Every time I’m in the traffic, I marvel at how it works together so seamlessly, especially since people don’t use their brakes here. They use their horn instead. Near collisions are the norm, but surprisingly crashes don’t seem to be. I am in awe, even more than I was in Ho Chi Minh. The most exciting part about all this is that there is so much going on here that you get lost in the craziness. You are anonymous. I love it, and I had no idea how much I was craving that. As a side note, last night I had to undergo a couple of painful, pricey rabies shots. They were ones I should have received seven days ago but was given bad advice at the time. Anyway, whatever. It’s all part of the adventure (and the part that will keep on giving for months — as I pay it off). The beautiful thing was how friendly and attentive the medical personnel were. One young guy talked to me about living in Colorado, where he did his studies, and when I asked him if he ever skied, he sort of brushed it off and explained it was too dangerous. When I told him the traffic seemed more dangerous here, he proudly said he’d never been in an accident. Again, the awe is kicking in. It looks like this beehive will just be a stopover for me. 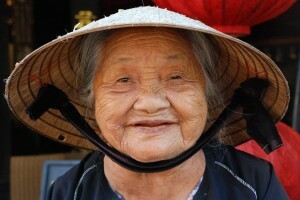 I’m headed on a train to Sapa tonight, and when I get back I’m going to head off to Ha Long Bay for a few days. Part of me wants to sink into the craziness here, but I’ve got forces pulling me east and west. One of my doctors last night summed up Sapa by calling it “very beautiful and very weird.” I don’t really know what that means, but it sounds kind of perfect. These kids looked like they were having a good time in Hoi An. 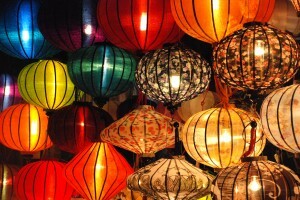 Well, I leave you with more pictures of Hoi An, my last stop. So far, that small town has been my favorite of the journey. It has a gentle feel to it, one that’s hard to describe but almost instantly palpable. One of the days I spent there I just rode a bike all across town, and that juicy bit of freedom was enthralling. I loved exploring little back alleys and small country roads and finding slices of life off the beaten path. I already miss the quiet, personal feel of the place, and I’m happy I’ll be there again soon. Until I find another internet outlet, here are some more pictures of Hoi An. 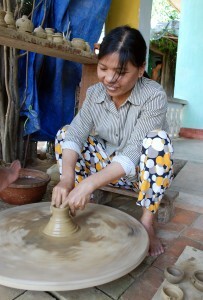 This woman makes all kinds of pottery at her shop, a mile or so out of Hoi An. 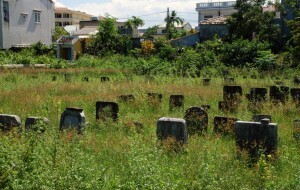 I found this overgrown Chinese cemetery as I wandered around Hoi An on my rented bike. This 90-year-old woman makes her living selling 50¢ ceramic animal whistles to tourists. Of course I bought a few. 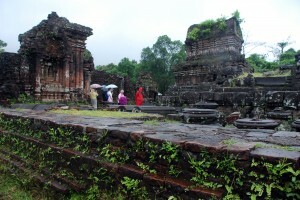 These ruins at My Son (near Hoi An) were created by Javanese people centuries and centuries ago. 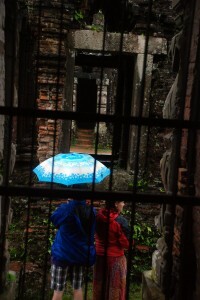 A couple looks into the ruins at My Son.